Door Step School, Pune. : Passing on the Baton of Education! At Door Step School, we try our best to get every child enrolled in a formal school. For this, we have to convince the parents to send their children to school. We also have to ensure that the school has a welcoming atmosphere for these children. While doing so, we had a surprisingly pleasant experience at one of the corporation schools in Pune. Last month, we enrolled two kids from Marvel Sangria construction site to a nearby corporation school. Both of them were eight years old, hence they were enrolled in the second standard as per the rule of age-appropriate admissions. The two children, after attending school for first day, returned to the Educational Activity Center (EAC) run by Door Step School at the construction site. The teacher at EAC asked them how their first day at school went. Both the children informed that they had a great day at school! This was not a usual reaction, hence the teacher enquired in detail. The children told that there was a girl called Pratiksha in their class, who welcomed them at school and stayed with them throughout the day. She offered her own notebook and pen to one of the newly enrolled children. She also helped them get their mid-day meal at school and explained the rules of the school to them. The teacher at EAC then found out that this girl Pratiksha Ganpat Devkate, age 8 years, has been attending one of the Door Step School EACs since Balwadi. Her father is a construction worker, while her mother works as a housemaid. 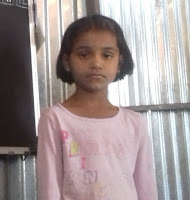 In 2014, Pratiksha was enrolled in the same school at the age of six. She has been attending school for two years now. The way she helped two newly enrolled children proves how useful and important it is to enroll children in school at right age. We are sure that Pratiksha would not be an exceptional case. There must be many like her who are not only benefiting from the opportunity to attend school themselves, but are also helping others jump on the bandwagon!